The sudden interest in Lantau, among the dozens of beaches hit by the surge in debris, suggests an attempt to burnish the government’s green credentials in the face of harsh criticism of its Lantau plans. Leung’s government has described its proposals for Lantau economic development as striking a “balance” between development and conservation, yet it offers no measures to protect habitats or to mitigate the impact of increased vehicle numbers, to name a few. The two beaches are among 27 identified by the EPD as prone to debris accumulation. Leung did not explain why he had chosen those beaches today. 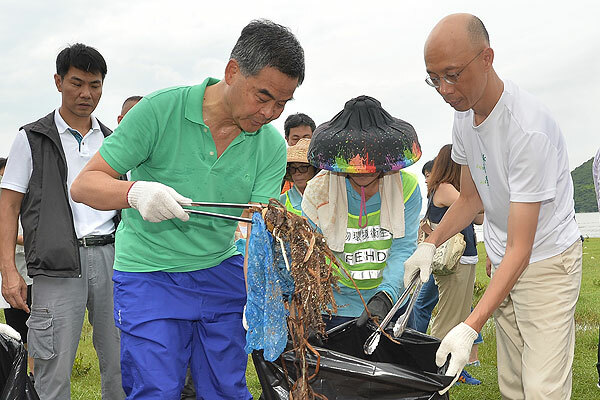 Today’s clean-up follows a visit to Shui Hau on June 18 by Environment Secretary Wong Kam-sing and Development Secretary Paul Chan and 40 other officials. Both Wong and Chan took part in today’s event. Chan, has no professional connection to environmental policy, is in charge of carrying out Leung’s plans for Lantau and the East Lantau Metropolis. As with dozens of other beaches across Hong Kong, the shores of Cheung Sha and Shui Hau have been laden with trash in the past ten days. The EPD has attributed it to debris being washed down the coast by the heavy floods in east China. Government rubbish collectors have removed nearly 80 tonnes from Hong Kong beaches since July 1. Leung said today he would raise with the issue of the debris with Guangdong authorities. After his timid lobbying over the abduction and detention of Causeway Bay booksellers, this hardly inspires confidence. If he is serious about improving Lantau’s beaches, he needs to do more than poke through some random debris for the benefit of the cameras. He must take seriously the government’s commitments to the global Convention on Biological Diversity and to offer specific plans to protect dolphins, wetlands, buffalo and other species and habitats.